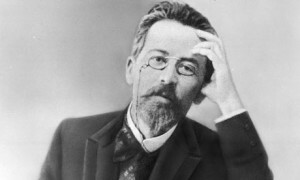 Anton Chekov has been on of the most celebrated playwrights and short story writers of the modern times. Konstantin Stanislavsky and his Moscow Art Theatre brought Chekov in front of the western audience at a time when Chekov was almost about to give up writing plays. Four of his most famous plays, “The Seagull”, “Uncle Vanya”, “Three Sisters” and “Cherry Orchard”, were all produced and staged by Moscow Art Theatre. Since then Chekov’s plays have been performed all around the world in multiple languages. In Kolkata, Chekov was made popular by the famous theater group “Nandikar”, and more specifically by Ajitesh Bandopadhyay. “Swan Song”, one of Chekov’s popular plays, is a touching portrayal of a sixty eight year old stage actor who laments the loss of his youthful days and the apathy of his audience. Swan Song  was one of his early plays featuring two characters: Vasili Svietlovidoff, a 68 year old comic actor and Nikita Ivanich, who is an even older man, the theater’s prompter. Following a benefit evening in his honor, unbeknownst to everyone, the comic actor Svetlovidov falls asleep in a drunken blur. When he awakens, the theater is dark and empty. He falls quickly into saddened monologue.. The play was also adapted by Ajitesh Bandopadhyay in Bengali as “Nana Ranger Din” and there is hardly any actor who hasn’t attempted this piece in his life. Couple of weeks ago, we did a broadcast of “The Swan Song” on EBC Radio on our EBC Drama Club show. The performers include Dwaipan Mukherjee as Nikita the prompter, and myself as Vasili the actor. The translation is by Marian Fell. Enjoy.